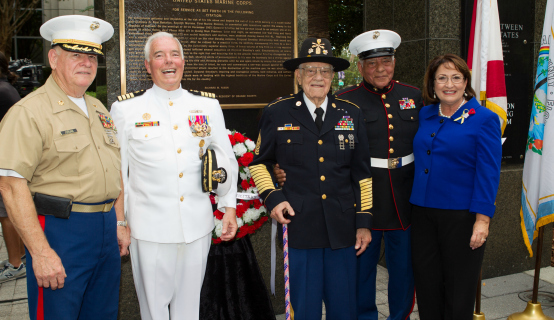 The Orange County Mayor’s Veterans Advisory Council led the War Memorial Commemoration Ceremony to honor the nation’s fallen Sailors, Soldiers, Airmen, Marines, and Coast Guardsmen. This year’s ceremony marked the 50th anniversary of the start of the Vietnam War, and paid tribute to the fallen and those held as prisoners of war or listed as missing in action in Vietnam. The Ceremony’s keynote speaker was retired Navy Capt. Warren Hudson, president of Lake Highland Preparatory School. He commanded a Swift Boat in Vietnam and was awarded the Purple Heart and Bronze Star with Combat “V” for valor, during his 26-year career as a U.S. Naval officer. Hudson reflected on the 162 names of service men and women inscribed on the Memorial Wall who lost their lives or were missing in action in Vietnam. No new names were added to the Memorial this year. Mayor Jacobs read a resolution calling on citizens to observe Memorial Day and pay special tribute to “those who gave their lives so that we might live free.” Mayor Jacobs recognized active duty military and veterans in the audience, and the spouses of those who served, including Carol Denton, the wife of longtime Orange County volunteer and American war hero U.S. Army LTC Earle Denton, who passed away in March. Earle Denton dedicated more than 25 years of his life to military service, was a committed advocate for the new Orlando VA Medical Center, and served on several Advisory Boards for Orange County, including the Veterans Advisory Council. Retired Army Command Sgt. Maj. Tommie Maldonado, Orange County Veterans Services program manager, hosted the ceremony. Retired Air Force Col. Tom Walters led the Pledge of Allegiance, retired Army Capt. Michael Waldrop introduced Capt. Hudson, and retired Navy Chaplain Capt. Richard Black delivered the Invocation and Benediction. Two WW II Veterans were honored: retired Army Command Sgt. Maj. Harry Shakes, who also served in Korea and Vietnam, and retired Marine Sgt. Louis Barra, who also served in Korea. Later in the afternoon, Mayor Jacobs honored the fallen at the Central Florida Veterans Memorial Park Foundation ceremony at Lake Nona. The Memorial Park is adjacent to the new state-of-the-art Orlando Veterans Administration (VA) Medical Center. Dedicated in 2013, the Warriors Memorial includes the names of 1,180 veterans from Orange, Lake, Brevard, Osceola, Seminole and Volusia counties who died while bravely serving their country. A collection of photos from the Orange County War Memorial Commemoration Ceremony and the Central Florida Veterans Memorial Park Foundation Memorial Day Ceremony are available on Flickr for use by the media.